Bossy ”r” is back at it again with these –ir words! 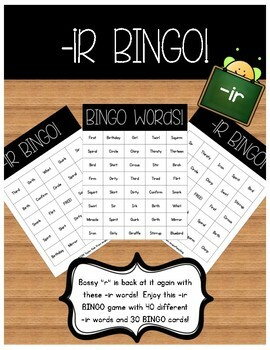 This –ir BINGO game contains 40 different –ir words and 30 BINGO cards--perfect for a classroom set! This activity will help students practice recognizing -ir words. 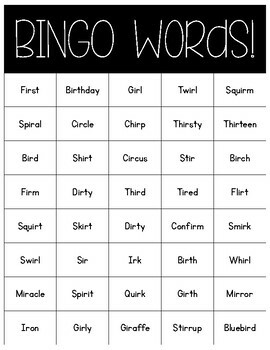 To use, simply print out the BINGO words on cardstock or heavy paper (or you can laminate them!) and cut the words apart. 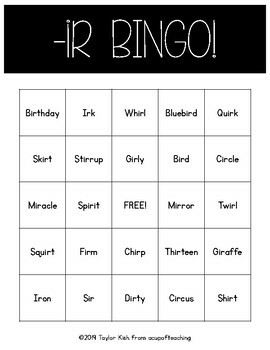 Then, print the BINGO cards; with 30 individualized cards, you should have plenty for a classroom set. If you'd like to use the cards again, print them on cardstock/heavy paper or laminate them; however, you could also print them on regular white paper if you'd like your kiddos to color in the boxes instead!